This story is about Karan who had a really smelly encounter a few weeks back. Karan was an electronics engineer and used to maintain a very good hygiene. He was very particular about cleanliness and used to take bath three times a day. He doesn’t even used to go to crowded areas because of the smell that people have because of sweat. His biggest nightmare was to imagine himself between people with sweat all over the body with a stinking smell. One day he was driving to Gurgaon, Delhi to install a heating ailment at the client side. At, Dhaulakuan he entered an unknown road and reached an unknown place. He could not find an exit. He came out of the car. The place was surrounded by trees everywhere. He heard a lot of voices of wild animals and got scared. Fortunately, he saw a cave and went towards the cave. He was just about to enter the cave and was horrified by something unusual and smelly. He started to think “What’s that smell boss?”He saw cow-dung everywhere and insects were flying on it. He had no option as wild animals were there outside the cave. He went in and saw a backward tribe of about 100 people and everyone was so stinky. Waves of smell that’s what Karan was going through. He could not even breathe. The cave was very cold from inside and the water in the river which flowed inside the cave was cold too. He asked from them is there any exit from here. A man named Mushi among them knew Hindi he gave him a warm jacket and told him that doors of this place open twice in 1000 years and will open again in next 5 days. He could not believe this and started thinking about the torture of smells he had to bear. He asked Mushi the people here do not take bath, it’s so smelly here and the cow-dung at the entrance stinks too much. He told Karan that this place is so cold that one day a man from our tribe tried to take bath and died of heart attack because of the cold water. We do not have electricity and heating instruments to heat water. He told that people even don’t even wash-off after going to the toilet, after that incident. Karan could not sleep the whole night because of the smelly waves. He woke up and thought of an idea which changed the way the tribe lived. He asked Mushi "Do you have wires here?" Mushi replied "I can’t say but we have a junkyard at the backside." Karan found everything he needed there at the junkyard. He made a 'Gobar gas Plant' for the tribe and the fuel was the Cow-dung. He had a heating ailment with him which he was taking along with him to fit at the client side. He made a geyser out of it. Mushi told the tribe in their language about the geyser and the 'Gobar gas plant'. The whole cow-dung was used in the ‘Gobar gas Plant’. The tribe people took bath one by one with the warm water. They even started to wash-off after going to the toilet. 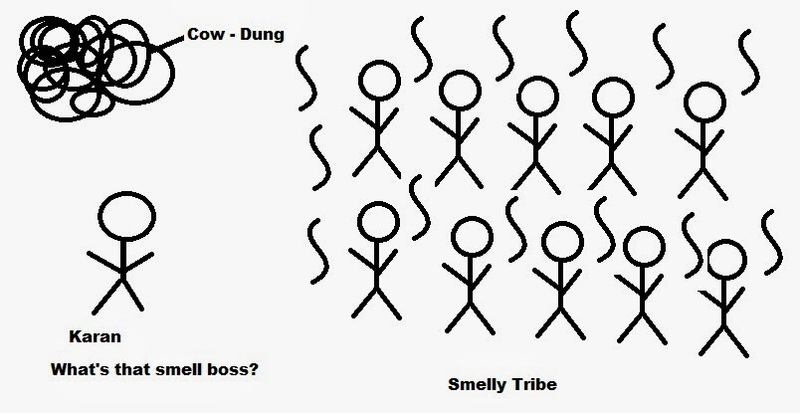 The smelly tribe turned into a clean tribe. The 5th day came and Karan went home. ha ha ha!!!! A nice story!!! All the best with for the contest!! Thanks!! Glad you liked it..